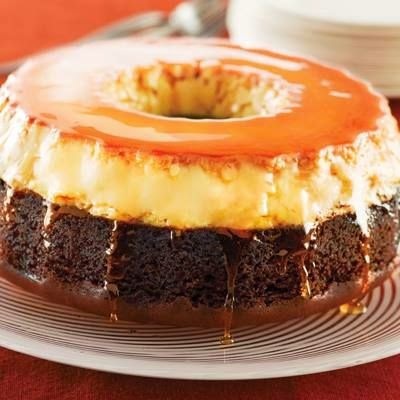 Flan Cake (Flan Impossible) | FoodGaZm..
HEAT sugar in small, heavy-duty saucepan over medium-low heat, stirring constantly, for 3 to 4 minutes or until dissolved and caramel colored. Quickly pour onto bottom of prepared Bundt pan; swirl around bottom to coat. POUR egg and milk mixture over caramel. Slowly add cake batter over the flan. Place pan in roasting pan in the oven. BAKE for 50 to 60 minutes or until wooden pick inserted in middle comes out clean. Remove pan from water. Let cool before inverting cake onto a serving dish. Cook's Tip: For a firmer flan, use 3 large whole eggs in place of egg yolks.